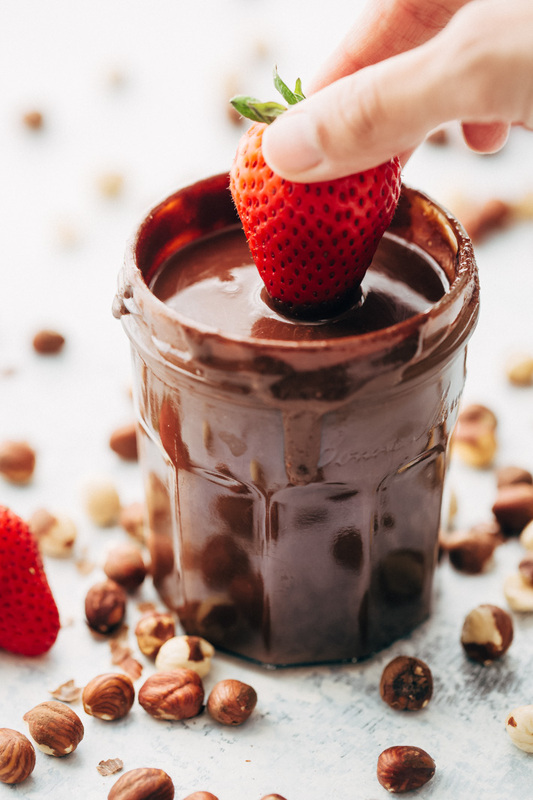 Learn how to make homemade nutella with just 7 simple ingredients. 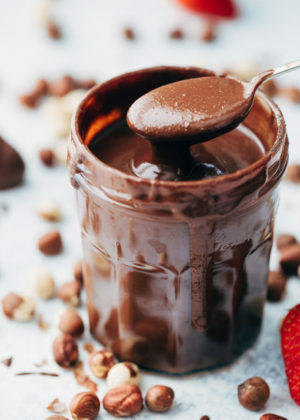 This nutella recipe is easy to whip up, tastes 1000 times better than store-bought nutella! Guys! The Monday blues calls for homemade NUTELLA. Say hello to the hazelnut spread that we all know and love. But wait, did I mention it’s like one-thousand-and-one times better than the prepackaged stuff you find at the store? 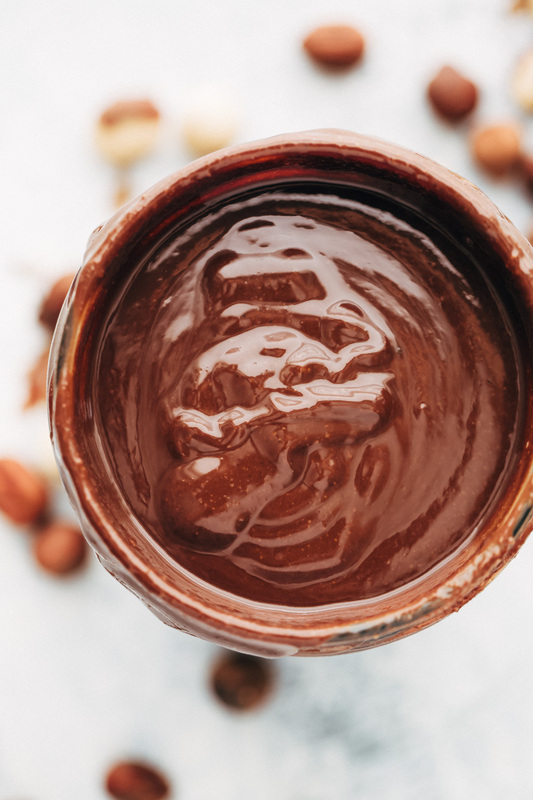 This homemade nutella is made with just 7 simple ingredients and a flavor that’s so hazelnutty and perfect that i’m ashamed I ever spent $5 on the store-bought stuff when I can easily whip it up at home in less than 30 minutes. It’s easy to control the amount of sugar you add to your nutella and the quality of the chocolate you use too. Not something you can do when you’re purchasing it pre-made. I love being able to control what goes into my food, don’t you? To be honest, before I ever made Nutella at home, I thought it would be a process. How am I ever going to get the hazelnuts silky smooth? How will the chunks of chocolate become a velvety spread? Won’t granulated sugar make it grainy? All of these questions and more ran through my mind on an endless loop. But you know what? Making homemade Nutella isn’t difficult and you can make a batch in around 30 minutes and keep it in your pantry for a whole month — that’s IF it actually lasts that long. We’re almost through my last batch — I made it a week ago. ? The ingredients for this hazelnut spread are simple, and you only need 7! The first step is to buy hazelnuts or filberts. Hazelnuts can be expensive so I usually prefer to buy them from the bulk bin, that way you get just what you need. You’ll need a total of 8 ounces of hazelnuts for about 1 ½ cups of homemade Nutella. My grocery store sells these raw, but if you can get your hands on roasted hazelnuts, you’ll cut your nutella making time in half. We’ll pop them on a tray and roast them for 10-12 minutes or until the nuts are nice and toasty. Stop them around the halfway mark, give them a good toss and pop it back in the oven. Next, let them cool for a few minutes. Grab a tea towel and place the nuts in the center, grab the sides and rub to help loosen the peels off. You don’t have to get all the peels off the hazelnuts but the more that you can get off the smoother your nutella spread will be. Now we’ll run the hazelnuts through a food processor until smooth. Keep in mind the processing times may vary, if you’re working with a Vitamix or BlendTec, it’ll probably take no time at all. I’ve listed the times my Cuisinart food processor takes and have added a link at the bottom in case you’re shopping around for a new food processor. One thing to keep in mind, a good way to tell you’re are the right consistency when processing the hazelnuts is when the hazelnut spread starts having an almost oily, sleek or shiny surface. Check out the video, it shows you exactly what we’re looking for. Add the cocoa powder, salt, vanilla, powdered sugar, and melted chocolate and start the food processor back up, drizzle in the oil to help thin the spread out just a bit. I like to use toasted walnut oil for this recipe because it’s more economical than hazelnut oil and though just about any oil would work, for optimum nutty flavor, I suggest going with hazelnut, walnut, almond, or sunflower oil. You can also try flavored oils if you’re into that sort of thing! For my next batch, i’m thinking blood orange flavored olive oil. Chocolate and orange pair beautifully together. ? That’s it! Lastly, keep in mind, homemade nutella will be a little thinner than regular nutella. And that it’ll also thicken a bit about 30 minutes after it’s blended as it cools. And not that there is a wrong way to eat homemade nutella, but may I suggest our favorite way, with fresh berries! Position a rack in the center of the oven and preheat the oven to 350ºF. Place the hazelnuts on a baking tray and spread them out into a single layer. Bake for 10-12 minutes or until they brown lightly. Remove the tray at the 5 minute mark and give the nuts a toss for evening browning. Let the nuts cool for 10 minute before proceeding. 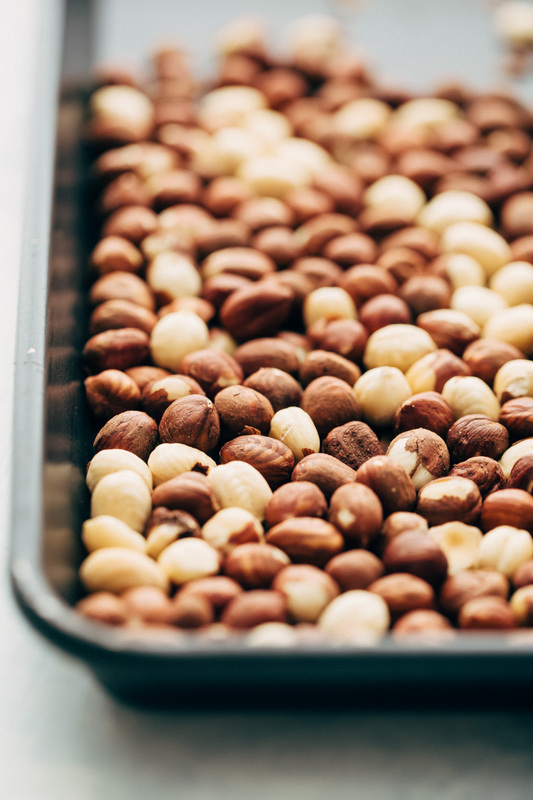 Place the hazelnuts on a kitchen or tea towel and rub vigorously with hands or on a smooth surface to help loosen the skin. If some of the skin doesn’t come off, that’s okay. Melt the chocolate in the microwave in 20 second increments, stopping the microwave and stirring in between until the chocolate melts. Mine took about 40 seconds. Add the hazelnuts to a food processor and let the processor run for 2-3 minutes or until a smooth, glossy paste forms. 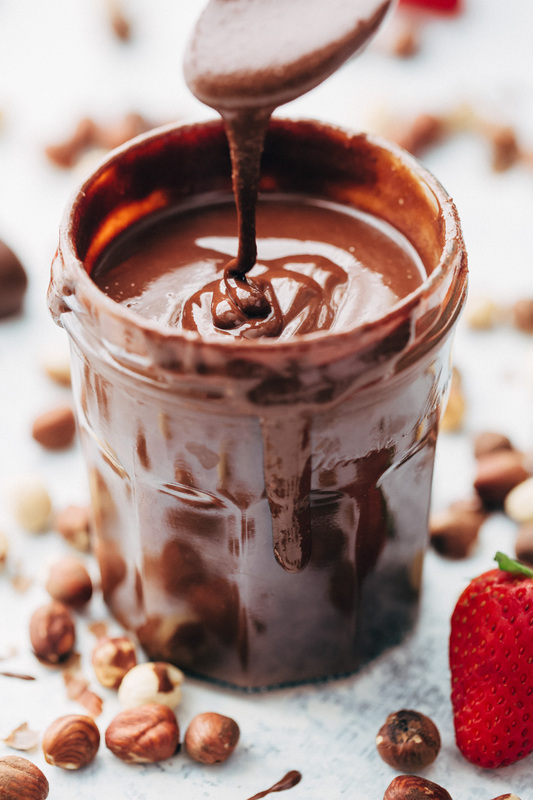 Add the vanilla, salt, cocoa powder, melted chocolate, and ⅓ cup powdered sugar for less sweet nutella at ½ cup for sweeter nutella. Let the food processor run for 1 ½ – 2 minutes while you slowly drizzle in the oil through the food processor opening. Keep in mind the nutella will be runny when you stop the machine but will thicken as it cools. For the oil, I suggest using a nut/seed oil such as almond, walnut, hazelnut, or sunflower. If you can’t find these, other options are coconut, corn, vegetable. Though chocolate chips will work for this recipe, I always find that they are harder to melt than chocolate bars broken into pieces.